Heavy-duty industrial grade steel shelving holds 475 lbs. per shelf. Durable high-density polyethylene bins have a molded in label holder. The hopper front provides easy access to the contents. Bins are waterproof, impervious to most chemicals and unaffected by grease or oil. Extra thick side walls with reinforced rib design give stack containers the strength to allow for 100 lb stack capacity per bin. 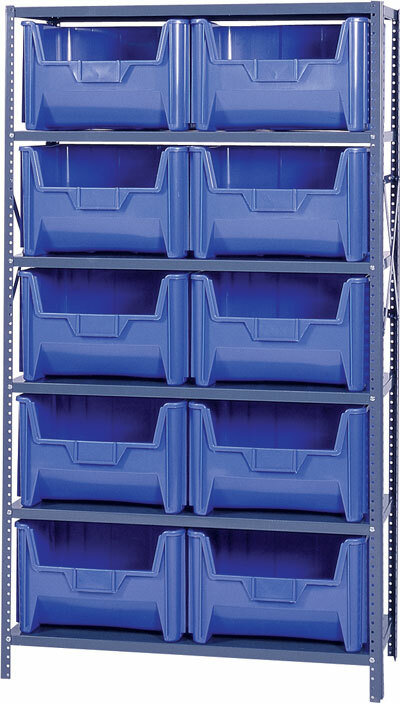 Giant stack containers have large grip side handles. Containers can be stacked 6 high. Optional clear window increase storage capacity andl allows for inspection of contents. Bins are available in gray, blue or green. One color bin per unit. Shipped knocked down. Assembly required.